CTE has also successfully overhauled, refurbished and upgraded a large proportion of the existing South African passenger rail rolling stock at our Touws River, Pietermaritzburg and Union Carriage and Wagon sites and our Engineering Services Division currently provides field support services (Warranty repairs, commissioning and technical support) to Prasa’s staff at 3 out of 4 of their main maintenance depots. CTE is a key contributor in the development of railway transport infrastructure, focusing on the design and building of rolling stock products which includes all types of electric locomotives, passenger electrical multiple units (EMU), all types of freight wagons and specialised railway equipment to satisfy customer requirements. 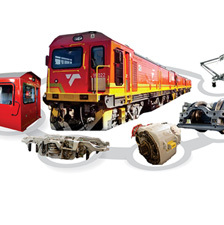 Since 1957, 14 000 new locomotives, suburban trains and coaches have been designed and manufactured at its 37-hectare facility situated at Nigel, South Africa. We have over time developed and continued to improve on our capabilities to deliver complex rolling stock projects. rolling stock engineering system integration.